Regardless of if you're a new mom or you have multiple kids, moms look to digital content to help them succeed as parents. As part of the POPSUGAR Insights "Find Your Happy" study, we asked women to tell us what types of lifestyle content they actively seek out in specific categories. Today we'll be diving deep into parenting content. As any first-time parent will tell, experience means a lot. Therefore it should not come as a surprise that expert advice (56%) content ranks as the No. 1 overall type of parenting content when women are seeking our information. Tips and tricks ranks second overall (51%), and news and information (51%) ranks third, as moms try to stay on top of the latest recalls and other parenting tips. Over 48% of moms seek out product reviews, and 42% of moms seek a little stress relief via humorous content or inspirational quotes or photos (40%). 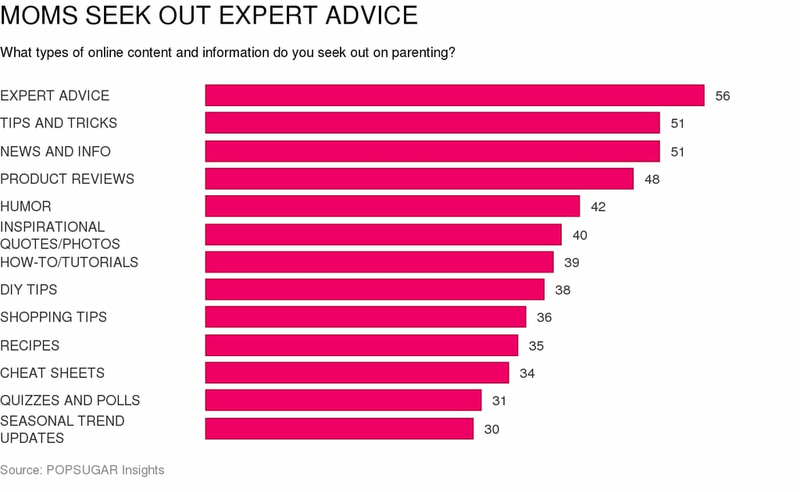 When moms seek out content to help them learn or achieve something, once again they look to experts to help provide them with sage advice (60%). Tips and tricks ranks second overall (50%), and less than half of moms seek out news and information (47%), how-to or tutorial content (45%), and product reviews (43%).